Fifteen bloated bodies were retrieved from the Meghna downstream yesterday, two days after an overcrowded launch capsized in the Chandpur confluence after being sucked into the eye of an eddy. Four of the bodies were found floating in the choppy river in Chandpur while 11 in Sadar, Daulatkhan and Borhanuddin upazila on the offshore island of Bhola, local administration sources said. Driving rains and fierce currents in the confluence of the Padma, Meghna, and Dakatia rivers frustrated all attempts by searchers to trace the triple-deck MV Nasrin-1. Police Superintendent of Chandur Mohammad Bakhtiar Alam told reporters that the body of a 45-year-old man was found in the Meghna at Harisava, another eight kilometres off the scene. Among the dead was Lalu Mia, 40, from Charputa union, but the identity of the rest were not known immediately. As the bodies were brought to Lalmohon, the supposed last stop of the capsized craft, hundreds of grieving people converged at the launch ghat -- some sobbing, some beating their chests with hands. The relatives of the missing gathered on riverbanks last night as reports of floating bodies broke. UNB adds a 60-year-old businessman, Lalu Haji, died of a heart attack as he received wrong information that his son was also travelling home by the launch that capsized. Earlier, people in villages along the Meghna found bodies and belongings of the launch passengers floating in the treacherous waters downstream in Chandpur, but could not retrieve those due to raging currents. Witnesses at Chandpur said they saw two bodies in the confluence early yesterday. "After floating for a fleeting moment, the bodies went underwater," said Khorshed, whose son Helal, 14, is feared drowned in the accident. Khorshed, a rickshawpuller, has been keeping a round-the-clock vigil sitting on the Meghna shore since the incident in the hope of finding his son. According to the upazila nirbahi officer and municipal chairman of Lalmohon, four bodies were seen at Daulatkhan, four at Borhanuddin, two at Ramgati and one each at Haimchar and Ilisha. On Tuesday night, three bodies were recovered -- two from the scene and one from Ilisha in Barisal, over 100 kilometres downstream the swift flowing river. There was no official word on how many passengers were aboard the launch which was heading off to Lalmohon from Dhaka, but survivors said it was carrying at least 750 people in excess of licensed capacity. Officials at the search site said 220 people were rescued or swam ashore following the sinking in the meeting point of three rivers where converging currents trigger eddies, especially during monsoon. Deputy Commissioner of Chandpur Abdur Rob Hawlader said: "Now I can't give you the exact figure of the people who were on board. But, I think the casualty would be the highest ever." 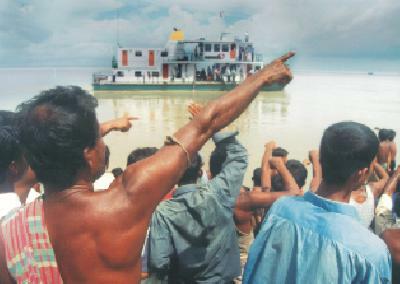 The accident rekindles the horror of May 3, 2002 when 450 people drowned after MV Salahuddin-2 sank, also in the Meghna, being caught up in a twister. Crowds of grieving relatives lined the Meghna banks yesterday with their hopes running low of finding survivors. "I doubt they are going to find my son alive," said day-labourer Hannan. Bangladesh Navy divers yesterday failed to reach the ferry, which is believed to be 200 feet underwater and might have been dragged downstream by strong currents. The divers were scanning the riverbed, but locals said the search could not get off to a full start because of rushing currents and swirling waters. Along with the navy, Bangladesh Inland Water Transport Authority (BIWTA) and Fire Brigade and Civil Defence teams were carrying out search operations. Navy officials said their divers could go only 30 feet deep. "We've the expertise to dive up to 300 feet underwater if there are no natural hindrances like severe current and turbulence," said an officer. Lieutenant Commander Mahbubur Rashid, who is leading the divers, said his men could dive in a maximum current speed of up to two nautical miles an hour, but speed in the confluence is six nautical miles an hour. A naval ship, Shaibal with sonar technology started from Chittagong yesterday for the accident scene and was expected to reach this morning. Rescue vessel Hamza arrived at Chandpur at about 5:00am yesterday. The bigger salvage tug Hamza along with Rustam that arrived earlier is jointly capable to lift the sunken launch weighing about 300 tonnes. BNS Barkat, BIWTA ship Turag, tug vessels Agrapathik and Agradut, CGS Patuakhali of the Coast Guard and some small boats are in operation at the accident site. Locals and some experts expressed scepticism about the salvage of the ship. "I don't think they are going to lift the vessel from the riverbed," an expert said, requesting anonymity. His comments evoke the memory of another launch MV Dinar that went down in the same estuary on August 20, 1994 with over 400 passengers on board and was never found again. But Lieutenant Commander Mahbubur Rashid hoped that his men would be able to pull MV Nasrin-1 from the river bottom.